Baader T-Ring to connect Sony E/NEX DSLR cameras to photographic accessories. This adapter is very thin and adds only 8.3 mm onto the 18 mm backfocus of the camera housing. On the camera side it comes with Sony E/NEX bayonet. On the telescope side it has T2 female thread. Besides the T2 thread, the design also includes an M48-thread – and even bigger – the outer part of ultrawide S52-clamping system. 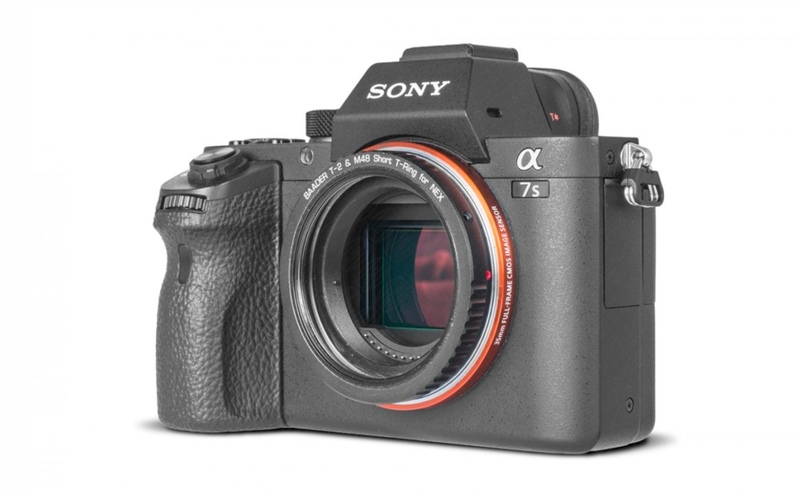 The Sony Alpha 7 cameras – especially the 7S and 7SII – are very interesting for astronomical purposes because of their high sensitivity, short backfocus light weight and very compact body dimensions. This very short T-adapter for Sony E-Mount/NEX bayonet, which adds only 8.3 mm onto the 18 mm backfocus of the camera housing, enables an adaptation to all backfocus-critical systems like HyperStar or fast Newtonians.